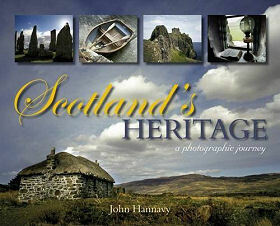 Scotland's Heritage by John Hannavy is a lovely book that works very well on a number of different levels. At one level it offers the casual browser a superb collection of photographs of many of the most interesting corners of this wonderful country of ours. Simply judged as a book of photographs, this is a book that continues to delight as you delve deeper: not least because of the range of subject matter on offer. This is a book that will be enjoyed by visitors and newcomers to Scotland and by those who have lived here all their lives. It's certainly one we'd strongly recommend to anyone wanting a feel for the sheer range of what the country has to offer. But what John Hannavy has produced is far more than just another book of photographs of Scotland. His approach has been to take a series of themes, and cover each in turn with a chapter that combines his outstanding photography with highly informative captions and a linking text which sets out the background and draws the strands together. The text includes the author's own descriptions and background analysis, but also shows many aspects of Scotland through the eyes of travellers who have passed this way over the centuries. The result is a combination of the author's own words with quotes from the likes of William Camden from the 1500s, Thomas Pennant, Daniel Defoe, Samuel Johnson and James Boswell (of course) from the 1700s, and H.V. Morton from the last century. The selection of topics for individual chapters is fascinating, and ranges from the broad to the fairly specific. "The Marks left by Men" covers the traces we have left on the landscape, all the way from by the earliest residents of what is now Scotland to modern monuments and art. "Land of the Mountain and the Flood" covers Scotland's natural splendour. While this is a subject which can, and has, occupied many volumes in the past, the author's photographs add considerably to the sense of completeness of the book. Later themes covered include "Great Houses and Humble Dwellings" and chapters on churches and religion, castles, "One Thousand Years of History", and "Living and Working by the Sea". In each case the author's choice of subject matter is fascinating, ranging from obvious subjects that really needed to be included, through to quirky and unexpected inclusions which add greatly to the appeal.